Tawana D. Feimster, D.D.S., M.S. Darnell Kaigler, Jr., D.D.S., Ph.D.
Kelton T. Stewart, M.S., D.D.S. Melanie E. Mayberry, D.D.S., M.B.A.
Michelle A. Robinson, D.M.D., M.A. LaQuia A. Walker Vinson, D.D.S., M.P.H. Bryan A. Williams, D.D.S., M.S. areas of cultural competency, mentoring, diversity and academic/community partnerships. These educators are helping to redefine our profession for the better. —Richard W. Valachovic, D.M.D., M.P.H. and Jeanne C. Sinkford, D.D.S., Ph.D.
Research indicates that patients from diverse ethnic, racial and socioeconomic backgrounds are more likely to seek health care from a minority provider. In addition, trends show that health professionals from underserved areas often return to those areas to practice. The ADEA/W.K. Kellogg Minority Dental Faculty Development and Inclusion (MDFDI) program develops more diverse generations of allied dental health professionals as an avenue to meeting the significant unmet need for dental care across the United States. 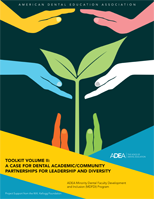 The ADEA MDFDI leadership training model emphasizes interprofessional education and team-based care, cultural and linguistic competency, academic mentorship and increased diversity in the academic pipeline. Academic/ community partnerships funded through the ADEA MDFDI program increase diversity in the dental workforce, support educational objectives and provide leadership training. The program also provides a framework for mission-driven activities in diversity programming. Cultural and linguistic competency in experiential learning and patient care. Academic and pipeline recruitment and development. Dental and preventive care for children in new models of delivery. As it evolves, a critical purpose of the ADEA MDFDI program continues to be increasing student diversity and the recruitment, retention and leadership development of URM faculty. The ADEA MDFDI program has been supported by a series of grants from the W.K. Kellogg Foundation. This toolkit focuses on developing dental and allied dental teams and strengthening the pool of URM allied dental health professionals. It builds on institutional models, the convenings, lessons learned and best practices that have helped change institutional climates. Download the Toolkit Volume II or the Toolkit Volume I. The ADEA MDFDI program began in 2004 with a $2.4 million grant, six year grant from the W.K. Kellogg Foundation (MDFD I). MDFD I grants were awarded to six dental schools and one dental academic consortium. The six dental schools included the University of Alabama at Birmingham School of Dentistry, the Texas A&M University Baylor College of Dentistry, the Howard University College of Dentistry, The University Illinois at Chicago College of Dentistry, the University of Michigan School of Dentistry and the University of Oklahoma College of Dentistry. The seventh award was made to the New York State Academic Dental Centers (NYSADC), a consortium of five dental schools in the state of New York (Columbia University College of Dental Medicine, New York University College of Dentistry, Stony Brook University School of Dental Medicine, University at Buffalo School of Dental Medicine and University of Rochester Eastman Institute of Oral Health). In these years, the MDFDI program had a dental faculty leadership development focus. A “grow your own” approach to faculty development, recommended by deans of U.S. dental schools, prevailed throughout the grantee schools, supported by institutional leadership and climate and structured mentoring programs. The participating schools placed a strong emphasis on URM recruitment and academic/community partnerships. The experiences of participating programs inspired Growing Our Own: The ADEA Minority Faculty Development Program, a Manual for Institutional Leadership in Diversity, a 126-page publication identifying best practices to recruit and retain URM faculty. In 2012, the ADEA MDFDI program expanded its critical efforts to improve diversity in dental student and faculty populations with the support of a $200,000 grant from the W.K. Kellogg Foundation (MDFD II). MDFD II grants were awarded to two dental schools: the University of Detroit Mercy School of Dentistry and the Howard University College of Dentistry. These grants focused on allied dental leadership development—a change both visionary and timely as the dental profession moves toward team-based care—and continued the program’s strong emphasis on the recruitment and academic/community partnerships. In 2013, the W.K. Kellogg Foundation awarded a $400,000, two year grant (MDFD III) to the ADEA MDFDI program to enhance the formation of academic and community partnerships for dental health professionals, and ultimately reduce oral health disparities for vulnerable children and communities. The first year (2013-14) supported partnerships between the dental schools and allied dental programs at the University of Detroit Mercy, Georgia Regents University and Howard University College of Dentistry. In the second year (2014-15), grants were awarded to the Howard University College of Dentistry, the University of Minnesota School of Dentistry and the University of Oklahoma College of Dentistry. Participating schools used program funds to support leadership development for URM allied dental faculty; academic/community partnerships providing screening and preventive dental care to children and URM communities; and recruitment and service partnerships that strengthen the URM student pipeline and improve the public understanding of the link between oral health and overall health. In 2015, the W.K. Kellogg Foundation (WKKF) awarded a two-year, $200,000 grant to the ADEA MDFDI program to address oral health disparities experienced by vulnerable children and their families. In 2016, the MDFDI program was awarded the second component of that grant. ADEA MDFDI partner schools, via more than 130 academic/community collaborations, will work under the program to extend its efforts to geographic areas with new or no existing dental schools. These new partners will work hand-in-hand with dental and allied dental faculty to provide dental and preventive care to children and adolescents in underserved areas. ADEA serves as the Central Program Office (CPO) for oversight, administration and reporting on the Kellogg Foundation grants which support the ADEA MDFDI program. ADEA conducts institutional and virtual site visits with dental schools for communication and reporting updates, and also holds conference calls with program leaders to provide oversight and advice regarding outcomes and sustainability.